Some of what’s going around. -SantaCon in Asheville is Saturday: Look out for a roving band of drunken Santas. 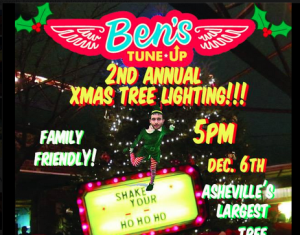 -Ben’s Christmas: The party starts at 5 p.m. at Ben’s Tune-Up for their second annual Christmas tree lighting party. I’ve heard there might be some SantaCon action at the party, so get ready to rock. -Holiday fundraiser: Town & Mountain Realty is holding a fundraising event Friday night at The Orange Peel. From 5-7 p.m., kids can hang and meet Santa Claus. From 7-11 p.m., there’s music and dancing and Highland beer. The company will match all local donations up to $10,000. The following nonprofits will benefit: Asheville Homeless Network, Helpmate, WNC Rescue Mission, Homeward Bound, Caring for Children. After working from home for seven years or so, I’m moving the stacks of papers, calendars, story ideas, research, books, horded Post-its, COFFEE POT, and more out to an “official” office. Carolina Public Press is opening an office in suite 234, 50 South French Broad Avenue in Asheville (in the United Way Building), and I’m moving there this week and next. Come by and say hello! -Greta’s gone: Greta Johnsen, the morning news reader at Asheville’s public radio station WCQS, has announced that she’s moving back to Chicago to go back to work for WBEZ, where she worked previously. -Forest Service management plan: The U.S. Forest Service has released a proposed management plan that’s getting a lot of discussion going in Western North Carolina. You can comment, too. To submit your comments email: NCPlanRevision@fs.fed.us. Hard copies of comments can be mailed to: National Forests in North Carolina, Nantahala-Pisgah Plan Revision, 160 Zillicoa St., Suite A, Asheville, N.C. 28801. Old Edwards Inn and Spa is excited to present Words, Wine and Friends: An Intimate Weekend with Pat Conroy, Ron Rash and Cassandra King January 30 through February 1, 2015. This exclusive weekend will allow guests to be up close and personal with three of the South’s most celebrated bestselling authors. Participants will be swept into a world of imagination, genius, literature and laughter with three authors who are as interesting in person as they are talented in their field. The weekend package includes two nights in Old Edwards upgraded suite, champagne arrival, book signings, readings and panel discussions, two private author-hosted dinners by celebrated Southern chef Johannes Klapdohr, morning meals with authors and much more. -New Asheville bus schedule: Sunday and holiday service is coming to Asheville’s bus system starting in January. -New Asheville Greenworks executive director: Dawn Chavez is the new executive director of Asheville GreenWorks. -West End Bakery cookbook: Cathy Cleary of West End Bakery is releasing a new cookbook on Dec. 12. A portion of proceeds will benefit FEAST. -Demolition on Biltmore: Demolition started this week on old offices at the corner of Biltmore and Hospital Drive, right across the street to one of the main Mission Health entrances. -Darlings opens downtown: Darlings, the retail shop that supports the nonprofit Pinups for Pitbulls in Asheville, opened on Black Friday. It’s somewhat hidden off of Biltmore Avenue. It is next to Go Yoga, and behind Asheville Wine Market. -French Broad Chocolate Lounge opens in new space: The wildly popular French Broad Chocolate Lounge opened at its new location on Pack Square on Black Friday. There was much rejoicing. And long lines all weekend. -New Bojangle’s on Hendersonville Road: There’s a new Bojangle’s going up on Hendersonville Road next to the new ABC store and the new Advance Auto parts, just south of Juicy Lucy’s restaurant. Due to some new designs for the remodeling The National will be putting its opening date ambiguously out there for early next year for now. Therefore, we will be rescheduling the grand opening weekend until further notice. Our dreams have gotten bigger for the space and what we want more than anything is to bring a really nice addition to the Asheville social scene even if that means taking a bit longer to open up. Thanks to everyone for all of the recent likes on our Facebook page. We would also appreciate anyway you could help us spread the word about our spot throughout our super cool little town. -Ruth and Ranshaw on the Cooking Channel: Ruth and Ranshaw, which makes tasty desserts “with a vintage twist” out in Fairview, has announced it will be featured in a Cooking Channel show called Unique Sweets. Look for the photogenic sisters Clair Baxter and Colleen Baxter-Jackson (owners of R and R), as well as other Asheville sweet-makers, on the show set to air Dec. 14. 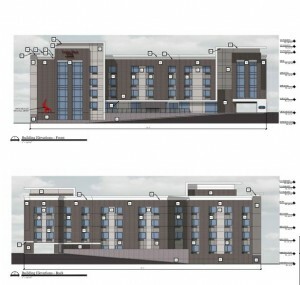 -New Asheville hotel plans: Here’s an initial look at the proposed Towne Place Suites, one of several new hotels planned for Asheville. The hotel as proposed is a 5-story, 65,246-square-foot hotel that “incorporates pedestrian-oriented design and an associated 83-space parking area” on a .60-acre lot located at 39 Elm St. off Merrimon Avenue, according to a city committee reviewing plans. (The lot is next to the Exxon station on Merrimon that is home to the 51 Grille restaurant, close to downtown.) The committee met recently, with members noting they had several issues with the design as proposed. They’ve asked developers for changes. -Hi-Wire Brewing poised for growth: Adam Charnack, co-owner of Hi-Wire Brewing in Asheville, gave a presentation Wednesday morning to a networking group at Mojo Coworking. Charnack said his brewery is poised for growth, adding that he’s hoping to make an official announcement before the end of this year. A couple of months ago, word on the street was that Hi-Wire was planning to start a new production facility just off Biltmore Avenue, though Charnack has yet to comment on that. Norm’s personal accomplishments include a 10th place finish at Boston Marathon, and a 1st place finish at Carolina Marathon, with PRs as follows: 2:19:23 in the Marathon, 1:05:36-Half-marathon, 49:42-10 miles, 14:20.1-5k, and a 4:08.2-Mile. To get started, email jusrun@jusrunning.com with “Coach me, Norm!” in the subject line. -Shakey’s remodel: Ole Shakey’s, the dive bar/biker bar next to the popular Bywater bar on Riverside Drive is getting a facelift. The bar has a new owner, who is putting some much-needed remodeling love into the place. Follow Ashevegas on Twitter. That’s where I post a lot of news first.